A History: The United States began the War of 1812 to redress certain violations of its sovereignty by the British and to capture Canada for itself. The American leaders chose 1812 because Britain was heavily involved in fighting Napoleon in Europe. By mid 1814 little progress had been made by either side in accomplishing their war goals. With the problems in Europe abated for the time, Britain decided on a three pronged attack on the United States. First an attack down from Canada, then one against Baltimore and Washington, and finally, New Orleans. The first two had failed and peace negotiations got serious in Belgium when the final effort began. At the peace conference, the British were aware of the upcoming campaign against New Orleans and deliberately left wiggle room for success there, hoping to negate the Louisiana Purchase entirely, or as much as possible. American grievances were not addressed and commissions were established to define the boundaries of the United States and Canada. It was signed on December 24, 1814. As in all military operations, there were a lot of coulda/woulda/shoulda things that I will ignore for the time being, and concentrate on what actually happened. The weather during the series of battles was reported as rain during the day and frosts during the night. Some accounts mention fog, others not. The "Battle" of New Orleans was actually a campaign designed to capture the city for the British. Ships bearing troops and supplies, from various points, congregated in the Gulf of Mexico, about 80 miles east of the city. They could get no closer because the gulf was very shallow in that area. Troops and supplies were placed on small boats and rowed the 80 miles to the Villere Plantation where they set up their camp. About 1/3 of the troops arrived during Dec. 23. Jackson learned of this movement about noon and planned an attack for that night. For the night attack, Jackson had about 2,100 regular soldiers, cavalry, Indians, and militia. He was also supported from the river by a number of small armed boats. The British began with about 1800 regular, very experienced, troops. The British had neither eaten nor slept for 24 hours and were preparing their meals and sleeping when Jackson attacked. Due to confusion, darkness, and a continuous stream if incoming British troops, little progress was made by either side. The fighting ended about 4am and Jackson retreated two miles north to the Chalmette Plantation. Casualties were light on both sides. At Chalmette Plantation, Jackson began to dig out an old canal and build a dirt and wood earthwork from the Mississippi River to the swamp on the east. He was assisted by citizen volunteers and slaves from local plantations. By Dec 28 it was mostly completed. By the 28th, British General Edward Pakenham had taken charge and decided on a reconnaissance in force to test the American defenses. He had some success against the American left at the swamp but called off his attack when his artillery ran out of ammunition. Jackson, seeing his weakness there, extended his line into the swamp using wood and logs. It is reported the militia at that point stood in waist deep water for the subsequent fighting. Pakenham decided to reduce the American earthwork with artillery. On Jan 1 he moved up his reinforced and resupplied cannon and began to bombard the earthwork. The American cannon responded. Because the earthwork was made of soft mud, and twelve to twenty feet thick, no significant damage was done. The British gunners had the most casualties because they had poorly made gun emplacements. This action is usually referred to as the Artillery Duel. For Jan 8 Pakenham planned a two pronged attack. One group would cross the Mississippi and attack a small artillery emplacement on the west bank, then use those guns on the east bank Americans, while the main British force attacked the American troops behind the earthwork on the east bank. To cross the ditch dug by the Americans, bundles of sugarcane and ladders were to be carried by the leading British troops. The west bank assault was delayed and played no part in the fighting on the east bank. Pakenham decided to attack the ends of the American lines because of the vulnerability he discovered on the 28th. On his left, his leading troops "forgot" to pick up the sugarcane and ladders. When they came under fire they broke and ran... possibly to go get the bundles and ladders. A followup unit actually broke into the American lines there but was repulsed because other supporting units had been destroyed by cannon and musket fire. On the swamp end of the line, the British encountered the extended and strengthened American left. As the British assault began to falter Gen. Pakenham rode forward to encourage his troops. He was unhorsed by a cannon blast and killed by a rifle shot when he tried to remount. At about the same time the other two ranking generals, Samuel Gibbs and John Keane were hit. Gibbs died on the spot and Keane was carried from the field. The surviving General, John Lambert, halted the attack and asked for a truce to bury the dead and tend the wounded. Of the 7,500 British troops involved, about 2,000 were killed, wounded, or missing. 44% of officers of all ranks were killed or wounded. Most of the British casualties have been attributed to the American artillery, maned by Jean Lafette, his brothers, Dominique and Pierre, and their pirate cohorts. Jackson's troops suffered about 20 men killed or wounded. The British packed up and went home on Jan 18. Pakenham and Gibbs were packed in casts of rum for the voyage. They were said to have left in good spirits. The commemoration and reenactment of these events began under my watchful eye on this January 7th past. In Jackson Square, (formerly Place de Armes) a tall thin park ranger depicted General Jackson by standing on a precarious makeshift platform, and after introductions, remained entirely silent. Robert Livingston, portrayed by a distinguished French diplomat (assigned to promote the speaking of french in Louisiana), read, in both English and French, the call to arms, as originally presented 200 years previously. They were backed up by 30 or so reenactors in period dress, representing the various units of regular army troops, militias from various states, Indians, Pirates, and townspeople. I introduced myself to one of the militia men. He was from California and was visiting his son, an NOPD officer. He had a complete outfit, researched on the internet, and authentic except for color. He was outfitted with a flintlock musket, cartridge pouch and all the proper accoutrements. During these four days many people, besides the reenactors, were dressed in complex and often elegant costumes. January 8, dawned cloudy, piercing bitter cold, and windy. Large capacity heaters set up by the Park Service served mostly as decorations, unless you were tall and stood close. Then a small portion of your head would feel a slightly reduced chill. Wife and I arrived late to the actual battlefield and missed most of the speeches. We did hear the English Ambassador speak about the battle and the importance of continued good relations between our countries. This was followed by "Taps" Played "in echo" by two excellent buglers . Inside the visitors center there were a number of informative displays and videos depicting various portions of the New Orleans Campaign. If one more person had entered that building there would not been enough room left for anyone to turn around, much less move... but, it was warm. Friday was much like the eighth, weather wise. We went back to the battlefield for the demonstrations of period crafts, weaving, powder horn making, musketry, and cannon firings. I noticed a small number of differences between these cannon procedures and those used in the Civil War. Then we went to the reenactors battlefield, about a half mile away. The area was to be a subdivision before Katrina. Now the owner has leased it to The Louisiana Living History Association, presumably for annual reenactments of the battles of New Orleans. The field was cleared, about 200 yards (meters) wide and 600 long. On the north end a replica of the original defenses, built by Jackson, complete with cannon embrasures, and redoubt, had been erected. Friday night brought the reenactment of the night battle of December 23, 1814. Spectators were allowed to stand at the dirt and wood berm of the Jackson defenses and watch the battle taking place in the open field to their front. Huge portable lights illuminated the area. Mostly all one could see were the backs of the American troops and the flashes and sparks from the English muskets and cannon. The freezing wind kept the gun smoke from obscuring the view... this time, and for each of the other engagements as well. Saturday's weather was the same. Wife and I arrived early and I made friends with some of the cannoneers. I quizzed them closely on their guns and procedures. At 10am spectators stood behind barricades set back about 50 yards behind the Jackson defenses. Again, spectators watch the backs of the American troops as they defended against the "reconnaissance in force" of December 28, 1814. Between battles we wandered around the encampments and the sutlers (Venders) tents. I hoped to talk to some of the British (actually Brits from England, some Canadians, and some Australians) but they were having drills and inspections in formation when I went to their camp. Some of the British and many of the American reenactors were from the North, where they mostly do battles from the French and Indian War, The American Revolution, and the War of 1812. Idle times found us wandering about in the French Quarter. We saw the Presbytery, the old US Mint, and the Civil War Museum. We ate well and often. 1pm brought us back to the area behind the Jackson Defenses to watch the reenactment of the Artillery Duel of January 1, 1815. This time I searched out the bleacher on the highest ground (nearly one foot above surroundings) and got us seats on the top (fourth) row. If I stood, I could occasionally see a line of British troops or their cannon blasts. 4pm brought us up to the Jackson berm to watch the reenactment of the January 8, 1815 engagement that occurred on the west bank of the Mississippi. Wife and I had given up our room at Place de Armes hotel and moved to Slidel. This to avoid a raise in rates from about $125 a night Tuesday, Wednesday, and Thursday , to over $350 a night for Friday and Saturday. Our reward, besides a $90 room, was an excellent dinner at a lakeside marina/yacht club. Sunday weather was slightly less cold. 10am brought on the climactic battle of January 8, 1815. Spectators were again stationed in the area 50 yards behind the Jackson Line. I secured my regular observation point early and recruited some pleasant folks to join us. The curse, was a "talker" who joined us and insisted on talking from 9am, shortly after I secured our seats, until we left after the show. 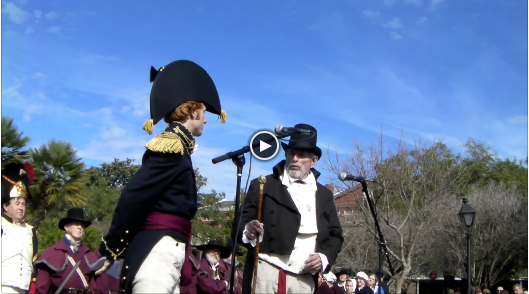 The following pictures and video should tell the story of the reenactment... The mule team may have been the simulated ambulance. Sorry! the video has not downloaded. i will try again later.